The buzz remains strong with this third Grapefruit anthology of trippy British psychedelic pop. 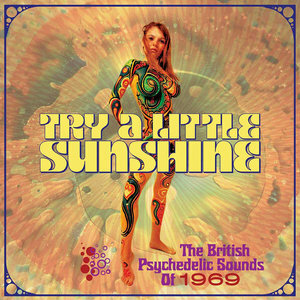 David Wells and Grapefruit Records continue to raid the archives of late '60s British psychedelic pop with their third Nuggets-like box set, Try a Little Sunshine: The British Psychedelic Sounds of 1969. The set continues from previous Grapefruit Records releases Let's Go Down and Blow Our Minds: The British Psychedelic Sounds of 1967 and Looking at the Pictures in the Sky: The British Psychedelic Sounds of 1968, offering, like those, three CDs of music from the year in question accompanied by a booklet of brief but excellent liner notes and period artwork. By the collective evidence of these sets, it could appear that every British youth between the ages of 17 and 22 was in a band of some sort during this period; there are so many vibrant, if fleeting, talents gathered here. Admittedly, by 1969 Technicolor lollipop psychedelia was getting a bit long in the tooth. When we hear Angel Pavement singing of purple alligators floating in cups of tea we may wish to adjust the dosage for something fresher, and Edwards Hand's "Magic Car", despite George Martin's billowy production, must have faded in esteem among scenesters already hip to the Who's gutsier and wittier "Magic Bus" from the previous year. Similarly, the Orange Machine's "Doctor Crippen's Waiting Room", while a delightful tongue in cheek "Doctor Robert" homage, can't help but seem quaint to ears that might have heard "Waiting for the Man" from an already two-year-old import copy of The Velvet Underground & Nico. But the thing is, there's always a mix of opportunists, wannabes, and actual talents with bad timing hovering around any scene, and they often make a joyful noise in spite of themselves. Not every band is groundbreaking and new, but that shouldn't keep the strivers from striving. Authenticity is a slippery slope, after all, and even the most cynical listeners must give themselves over and dance to the wondrous cacophony of the poseur who stumbles upon a good riff. The brain may crave authenticity, but the heart has never required a curriculum vita before giving itself over to the passion of a good sound, and there's an ample collection of groovy sounds here. Oddly, one of the most enjoyable elements of a collection like this is wandering among the also-rans and barely-weres to realize that they nonetheless contributed each in their own way. Even if the above mentioned period curiosities never rise above that status, they're still worth hearing. There are numerous gems to be found here. the Factory's "Try a Little Sunshine", which both opens and provides the name of the set is a de facto argument for the existence of such anthologies, a classic nugget that should be enshrined rather than left to sit in the darkness of a mine-like vault. Other valuable nuggets featured on the collection include the Montanas "Roundabout", which sounds like an Emmitt Rhodes outtake, Colin Griffin's "Changes in our Time", which captures the youthful impatience for change that was an essential part of the spirit of the times, and Ewan Stephens' cover of the Kinks' "Mindless Child of Motherhood", backed by its composer Dave Davies' blistering guitar work, threatens to surpass the original in its rawness. Many tracks, too, are important as documents pointing the way forward, missing links in the evolution of psychedelic music into new, adventurous forms of pop. Jason Crest's "Black Mass" was intended as a joke track but registers as an unsettling and effective piece of early British metal, particularly given vocalist Terry Clark's unhinged performance. Strawberry Jam's "This Is to a Girl" could be a sonic map tracing a path from psychedelia into bubblegum pop. Ralph McTell's "Summer Come Along" is a country and western inflected campfire sing-along that prefigures America's country-rock phase, just about to bloom from out of the Laurel Canyon Valley. Audience's "Riverboat Queen" reintroduces British Music Hall in a way that will be embraced midway through the next decade by Freddie Mercury and company. Try a Little Sunshine, though, is not just limited to the outliers; many well-known acts or figures from them are present here. Spencer Davis Group, Procol Harem, and the Move are represented by strong cuts here. Status Quo's cover of the Everly Brothers' "The Price of Love" is full of pop metal swagger, and it's amazing that not a single hair metal band of the 1980's excavated their mix for a cover. The Pretty Things appear with "You Might Even Say", a song documenting their search for a new direction after the disappointing reception of the now revered S.F. Sorrow album. Jimi Hendrix Experience bassist Noel Redding's unfairly dismissed side-band Fat Mattress is represented here by the lysergic "Petrol Pump Assistant" while Kink Dave Davies' takes the lead on the eerie "Creeping Jean". In all, Try a Little Sunshine is a trip from start to finish. Wells and fellow series producer John Reed are performing a great public service in making these obscure wonders widely available.